Winter Exercise: Top 5 Reasons to Skate! January usually makes people think of cold and staying indoors. For me, I think of skating! February brings Winterlude, and if the weather cooperates, many great days of skating. It is one of my favourite things about winter, and with the world's largest skating rink running though our fair capital, it's also one of my favourite things to do in Ottawa. Need more convincing? Here are the top 5 Best Reasons to Go Skating! Skating at a moderate pace burns as many calories as doing aerobics. In addition to being an excellent cardiovascular exercise, ice skating will challenge muscles you don't frequently use. Skating utilizes many leg muscles, in particular muscles in the hip joints - you're likely to feel the burn in the adductors, glutes, and quads. How is your core strength? While skating, the upper body is held in a forward position, engaging your core muscles. When it's cold you may feel less compelled to drink water, but it is just as important to stay hydrated during winter activities as it is in the summer. The great side effect of exercise burning calories is the heat it generates. Many people shy away from enjoying the outdoors during the coldest months of the year, but if you're out skating on the canal, you can expect to sweat! Dress in moisture-wicking base layers, loose warm outer layers, a toque, mitts, and a scarf, and your body heat will keep the chills at bay. Skating as exercise requires minimal equipment - a pair of skates and appropriate winter clothing. If you're living in Canada in the winter, you already have the clothing covered (or at least you should). Skates are cheap to rent or purchase (especially if you buy second-hand). And oh yeah, access to the canal is free - no pricey lift passes. Sure, you're on ice, and it's possible to take a nasty spill. But compared to the high rates of hospitalizations that originate on the slopes , skating is pretty tame. If you have young or inexperienced skaters, the right helmet will protect against head injuries. Hockey or alpine skiing helmets are designed for multiple impacts, and are therefore suitable for skating (and tobogganing! ), whereas bicycle helmets are designed to absorb a single large impact, and therefore less suitable (but still better than nothing!). Maybe not patriotic in the most traditional sense, but few things are more Canadian than lacing up a pair of skates for some fun with friends on an outdoor rink. Still stumped for Valentine's day ideas? 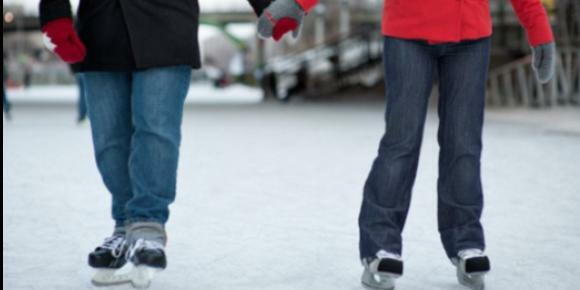 Pack a thermos of hot chocolate, and bring your sweetie for a romantic skate on the canal - it will be a memorable date that will give you a good reason to get cozy and keep each other warm après-skate. For more exercise and health articles and tips visit us at our website! Are you new to Arc of Life? We Would Love to Hear From You Here!